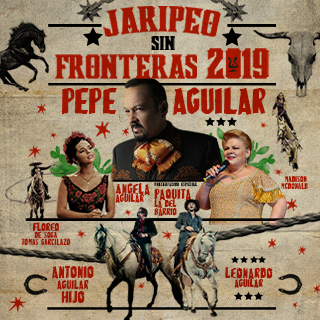 SAN ANTONIO (March 18, 2019) – Nine-time Grammy winner Pepe Aguilar will reprise his top-selling arena tour Pepe Aguilar Presenta Jaripeo Sin Fronteras this year, bringing the extravaganza back to San Antonio for an Aug. 24 date at the AT&T Center. It was Pepe’s vision to adapt the legendary Aguilar family’s touring tradition of Jaripeo for a new generation, an equestrian musical extravaganza combined with rodeo. The nearly three-hour show brings together bull riders, trick riders, 15 beautiful horses, rope tricks on horseback, tech and pyro, plus musical performances from Pepe, his daughter Angela and son Leonardo, both of which have been nominated for Grammys and Latin Grammys. It’s a multi-generation show for all ages.